Following up the Activity 1a, we will employ the same Resistor–Capacitor (RC) Circuit in this experiment. The hardware and software needed for this experiment will also be the same as used previously. Specifically, the Arduino board will be used for generating the input to the circuit and for measuring the output of the ciruit. The input to the circuit will be generated from one of the board's Digital Outputs, applied across the resistor and capacitor in series. The output of the circuit will be the voltage across the capacitor which will be read via one of the board's Analog Inputs. This data is then fed to Simulink for visualization and for comparison to our theoretical predictions. 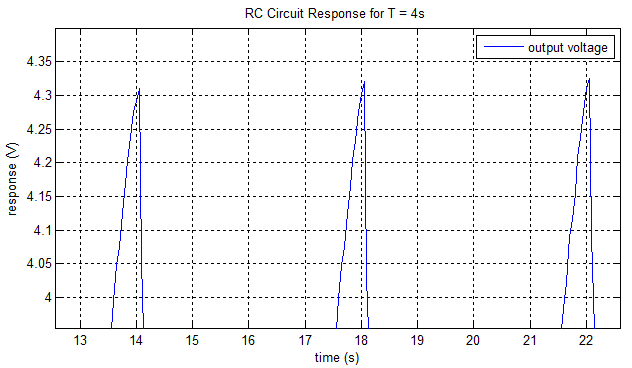 In the previous activity we examined the time response of an RC circuit. The purpose of this activity is rather to understand the frequency response of the same circuit. Specifically, we are going to experimentally construct the magnitude plot portion of the Bode plot for the RC circuit. In this activity we will sweep through a range of frequencies, but we will employ square wave inputs rather than sine wave inputs. In this regard, the magnitude response that we generate won't exactly correspond to the standard definition of frequency response. The reason we will employ square wave inputs is to build intuition regarding the meaning of the circuit's frequency response based on the understanding of the circuit's step response we gained in Activity 1a. The idea behind frequency response analysis is to examine how a system responds to sinusoidally varying inputs of different frequencies. If we have a linear system, as we do in this case, then a sinusoidal input of a particular frequency will generate in steady-state a sinusoidal output of the same frequency. The output, however, may have a different amplitude than the input and the output may be phase shifted as compared to the input. This idea is demonstrated below. One can understand the above by considering that if our system is represented as the transfer function , then the output is simply the product of the transfer function and the input, . Therefore, the output can be separated (via a partial fraction expansion) into a component with the poles of the transfer function (representing the system's natural response) and a component with the poles of the input signal. If the system is stable, then the natural response will die out resulting in a steady-state output that has the same form (poles) as the input signal. When we consider a system's frequency response, we are specifically interested in how the amplitude and phase of the steady-state output compare to the sinusoidal input. One way to represent this amplitude (magnitude) data and this phase data is as a Bode plot. A Bode plot consists of two graphs, one being the magnitude of the response (the ratio of the output amplitude to the input amplitude, ) versus frequency, and the other being the phase of the response versus frequency. Executing the following commands at the MATLAB command line will generate the theoretical Bode plot for our RC circuit (with , ). Examination of the above demonstrates that the RC circuit behaves like a low-pass filter (passes low frequencies and blocks high frequencies). At low frequencies, the circuit has a magnitude response of zero decibels. Recall that in decibels the magnitude is calculated as , therefore, a magnitude of 0 dB corresponds to the case that the output amplitude is equal to the input amplitude (the ratio equals 1). While at higher frequencies, the magnitude in dBs becomes more and more negative. This trend corresponds to the amplitude ratio becoming closer to zero, that is, the output is attenuated to a greater degree as the input frequency is increased. The trend observed in the phase plot is that the output lags behind the input to greater degree as the input frequency is increased. 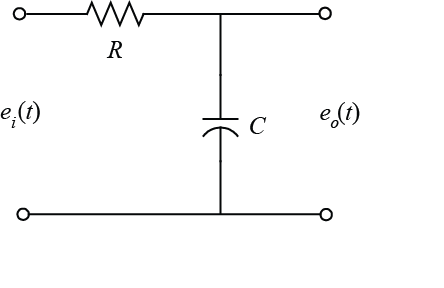 The break frequency for this circuit is determined by the location of its pole, that is, the break frequency equals . In the case of this circuit, and the break frequency is in the neighborhood of 1 rad/sec. 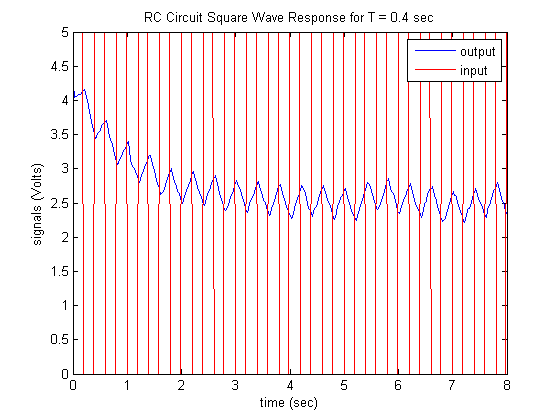 Recalling the form of the RC circuit's step response, we can anticipate how the circuit will respond to a square wave input of varying frequencies. We will verify our intuition with a hardware-based experiment in the next section. The overall purpose of this activity is to better understand what a system's frequency response means. 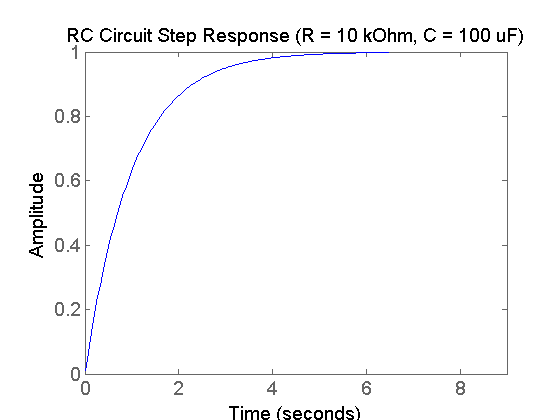 Executing the following commands at the MATLAB command line will generate the theoretical step response plot for our RC circuit (with , ). Examination of the above shows a standard first-order step response. For a square wave input, one can imagine that the output will rise as shown above when the input is "ON" and will decay exponentially when the input is "OFF." Cycling between the "ON" and "OFF" states will then generate a response like the one shown below. In the above figure, the period of the square wave input is sufficiently large that the system output has time to approximately reach steady-state before the input signal switches its value. Recall that for a first-order system, it takes approximately 4 time constants ( ) for the output to achieve of its total change. Therefore, when the input frequency is sufficiently slow (period sufficiently large compared to ) the output response will appear as in the above figure where the amplitude of the output is approximately equal to the amplitude of the input. This is what was observed in the Bode plot generated earlier. At low frequencies, the magnitude approximately equaled dB, which corresponds to an amplitude ratio of 1 (no attenuation). Further recall that it takes approximately 1 time constant ( ) for a standard first-order step response to reach of its total change. Therefore, when the square wave has a period of (frequency equal rad/sec for this system) the output response will not have time to reach steady-state before the input switches value again. As such, the amplitude of the output will be smaller than the amplitude of the input. This is observed in the previously generated Bode plot in that the magnitude above the break frequency (1 rad/sec) is less than 1 (less than 0 dB). As the frequency of the input increases, there is even less time for the output to react. This is indicated in the Bode plot by the fact the system's magnitude (the output amplitude) gets smaller and smaller as the frequency of the input is increased. We will investigate this phenomenon in the following experiment. In this experiment we will record the output voltage of the RC circuit for a square wave voltage input. Specifically, the voltage input will alternate between 0 Volts and 5 Volts, where the time "OFF" will equal the time "ON." The frequency of the square wave input will be varied and the resulting amplitude of the circuit's output response will be recorded to approximate the system's magnitude response. In a sense, we are generating the system's frequency response model empirically. This is sometimes referred to as a blackbox model or a data-driven model. The hardware and software setup we will employ is very similar to that employed in Part (a) of this activity. 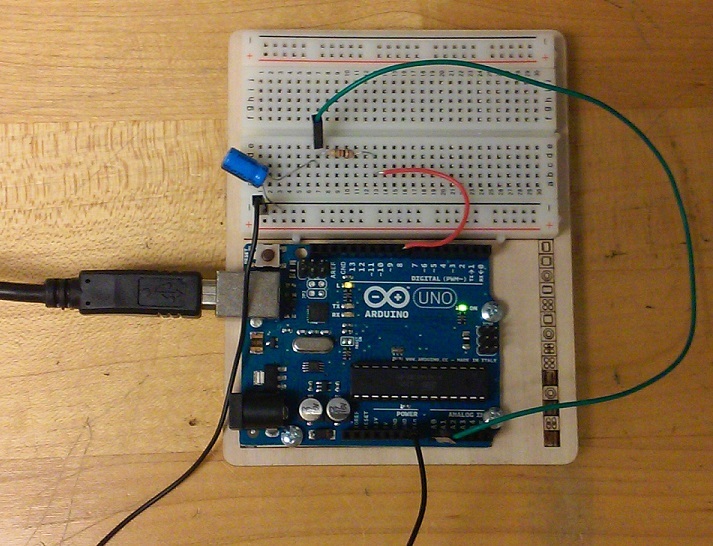 Our simple RC circuit can be implemented on a breadboard and connected to the Arduino board as shown. Recall that if you employ an electrolytic capacitor, its orientation matters. 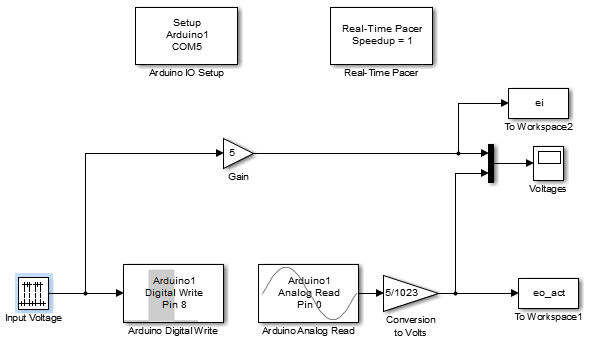 The Arduino board is employed to receive the input voltage command from Simulink and to apply the voltage to the circuit (via a Digital Output). The board also acquires the output voltage data from the circuit (via an Analog Input) and communicates the data to Simulink. In this experiment, the values of the resistor and capacitor are chosen ( , ) such that the circuit's time response is slow enough that the Arduino/Simulink setup can sample the circuit at a fast enough rate to give a clear picture of the circuit's output. Since we are generating the circuit's frequency response, we wish to be able to accurately capture the circuit's response at frequencies at least one or two decades above the circuit's break frequency (1 rad/sec). In this experiment, we will employ Simulink to read the data from the board and to plot the data in real time. In particular, we will employ the IO package from the MathWorks. For details on how to use the IO package, refer to the following link. The Simulink model we will use in this experiment is essentially the same as the one we used in Part (a) of this activity. The model can be downloaded here, where you may need to change the port to which the Arduino board is connected (the port is COM5 in this case). As shown below, the input voltage command is generated by a Pulse Generator block (for generating a square wave input). The Pulse Generator block generates values of 0 or 1 which are then fed to an Arduino Digital Write block. Since we are using channel 8 for the digital output, we double-click on the Arduino Digital Write block to set the Pin to 8 from the drop-down menu. An input of 0 to the Digital Write block causes an output of 0 Volts to be generated at the corresponding pin, while an input of 1 to the Digital Write block generates an output of 5 Volts. This scaling is captured by the Gain block that is included prior to the Scope block. 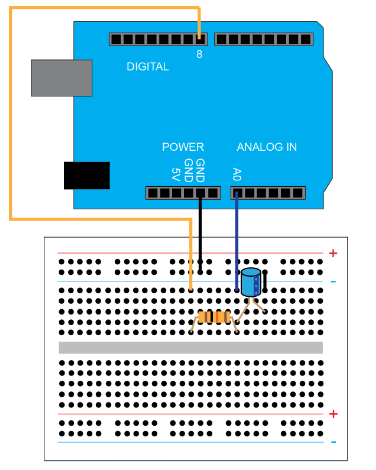 The Arduino Analog Read block reads the output voltage data via the Analog Input A0 on the board. Double-clicking on the block allows us to set the Pin to 0 from the drop-down menu. We also will set the Sample Time based on the frequency of the input being employed. For example, for an input frequency of 10 rad/sec (1 decade above the circuit's break frequency), we could employ a sample time of "0.02". This sample time corresponds to a sampling frequency of 50 Hz, which is more than 30 times faster than the frequency of the input signal (10 rad/sec 1.59 Hz). This means the that circuit's response for this input would be sampled more than 30 times per cycle. This is enough to capture the character of the system's output at this frequency. 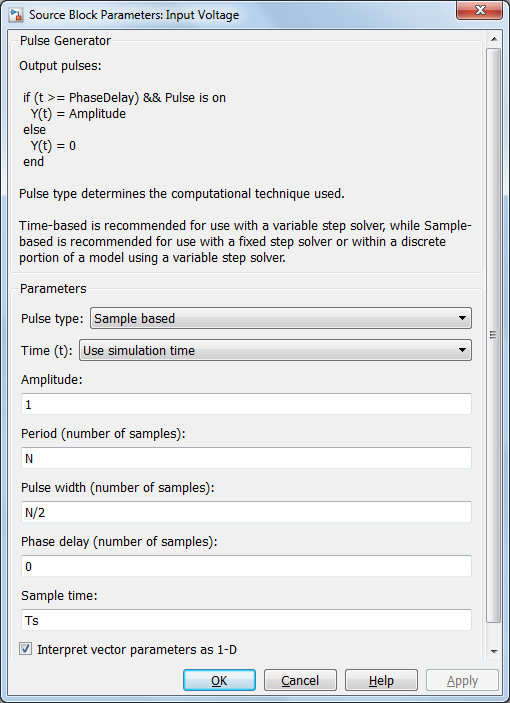 The downloadable model included above defines all sample times as Ts (or left as "-1"). Therefore, before you run this model you must define the variable Ts in the MATLAB workspace, for example, by typing Ts = 0.02; at the command line. The Gain block is included to convert the data into units of Volts (by multiplying the data by 5/1023). The given Simulink model then plots the commanded input voltage and recorded output voltage on a scope and also writes the output data to the MATLAB workspace for further analysis. The Arduino Digital Write block, the Arduino Analog Read block, the Arduino IO Setup block, and the Real-Time Pacer block are all part of the IO package. The remaining blocks are part of the standard Simulink library, specifically, they can be found under the Math, Sources, and Sinks libraries. To experimentally construct a Bode magnitude plot, we will sweep through a series of square wave inputs of varying frequency and record the amplitude of the output response. In order to get a complete picture of the RC circuit's frequency response, we need to capture frequencies ranging from at least 1 decade below the break frequency to at least 1 decade above the break frequency. Specifically, we will look at frequencies ranging from approximately 0.05 rad/sec (20 times smaller than 1 rad/sec) all the way up to about 30 rad/sec (30 times larger than 1 rad/sec). 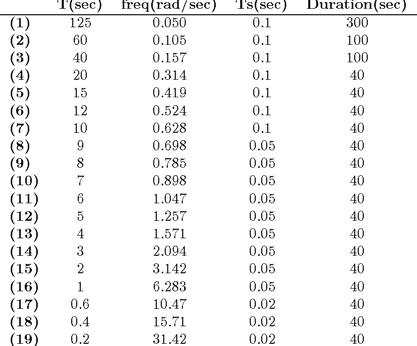 Below provides a table describing the input signal periods and frequencies, as well as the sampling time and duration employed to guarantee the circuit's response is sampled frequently enough and the response is given sufficient time to reach steady state. Now open (or create) the Simulink model provided earlier in this section. 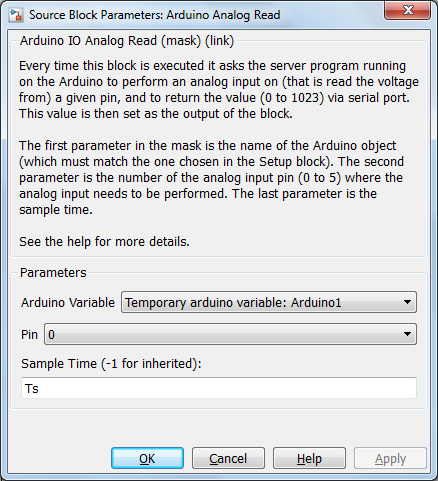 Double-click on the Input Voltage block and the Arduino Analog Read block, respectively, and set the parameters and as shown below. Before running the Simulink model, make sure that its run length is set to 40 seconds as shown below, corresponding to the table that we previously introduced. 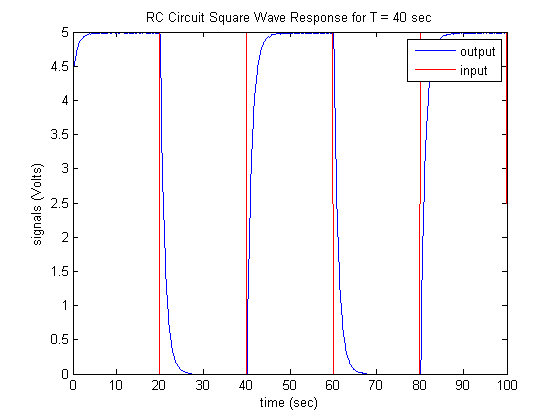 Entering the following code at the MATLAB command line will generate a plot like the one shown below which includes the square wave input and the circuit's output response. Once we have recorded the output response data, we can then go about calculating the magnitude of the system's frequency response at this particular frequency. From inspection of the above figure, the response begins with a transient period and reaches steady-state in approximately 7-8 seconds. After reaching steady-state, the maximum and the minimum values of the output signal can be estimated by simply zooming in on the plotted figure. Inspection of the above gives an estimate of the output amplitude of . Since the input amplitude is approximately , that means the system's magnitude at this frequency can be calculated as follows. This process can then be repeated for the 18 other frequencies specified in the table above. An example set of raw output response data has been stored here in frequency_response_data.mat. From this data, or your own, you can then estimate by hand the magnitude of the system's response at the other 18 frequencies. The example given above showed that the system attenuated the input somewhat (magnitude less than 1) at a frequency of approximately 1.571 rad/sec. This was to be expected since this frequency was slightly greater than the system's predicted break frequency. Entering the following code will allow us to examine the system's response for a slower frequency, specifically, for seconds which corresponds to a frequency of approximately 0.157 rad/sec. 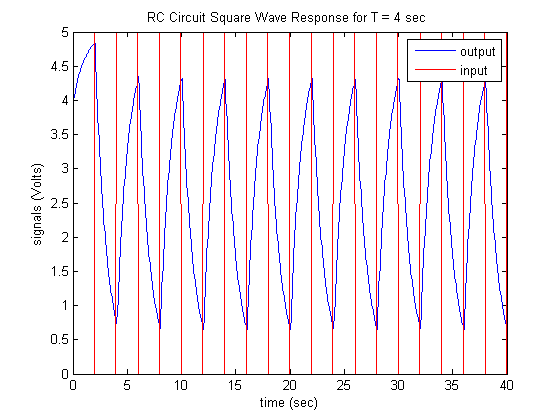 As expected, since the period of the square wave input is so much larger than the RC circuit's time constant, the output response has plenty of time to reach steady state before the input switches. 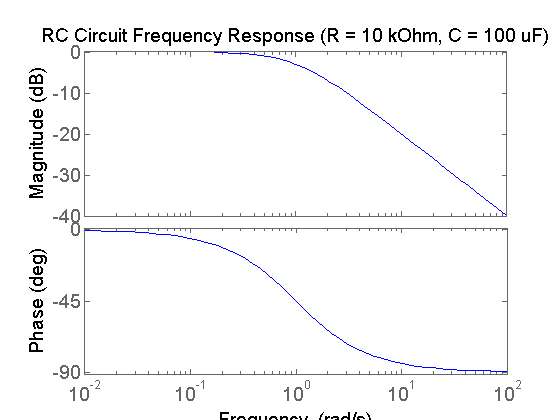 Therefore, the circuit's magnitude response at this frequency is approximately 1 (0 dB). When the period equaled 4 seconds, the circuit did not have enough time to reach steady-state, hence the output was somewhat attenuated. If we decrease the period of the input further (increase the frequency), the circuit will have even less time to respond and the output will be attenuated further. 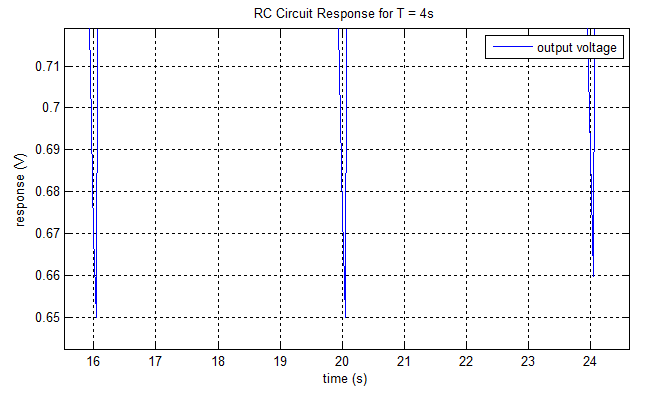 Executing the following commands will show the circuit's response for an input square wave with period seconds, which corresponds to a frequency of approximately 15.71 rad/sec. As we expected, the output is much attenuated as compared to the input. Another thing that you will notice is that the output becomes less stable at these higher frequencies. This arises for a couple of reasons. For one, since the output amplitude is much smaller, any errors or disturbances become a larger percentage of the amplitude. Second, as the frequency of the signals increase, a smaller sample time is required to get a sufficient number of points per period in order to reconstruct the output response. If the signals are sufficiently fast, we will run into the speed limitations of the experimental hardware and software. For the experimental set-up we are employing, we cannot achieve sample times faster than about 0.01 seconds. Therefore, at higher frequencies we may sometimes miss the true extremes of the output signal (the peaks and valleys could occur between samples). 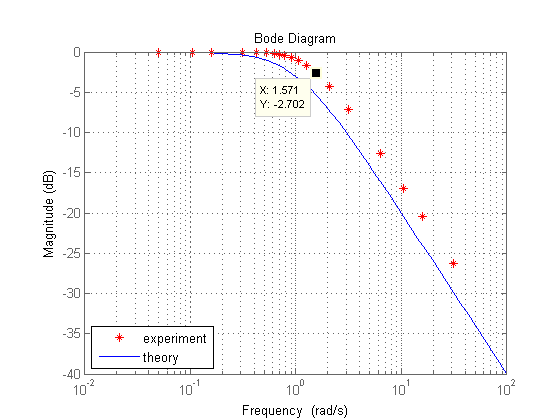 In order to construct the Bode magnitude plot we desire, we then need to calculate the gain at each of the 19 frequencies outlined in our original table. This can be performed manually as we demonstrated for seconds. Alternatively, we can employ the program plot_mag.m that we have written to generate the Bode magnitude plot. This plotting script employs the function cal_avg.m to calculate the average amplitude of the output response data for each of the prescribed periods. This function presumes the output data is saved with the same name and format as frequency_response_data.mat. Executing the program plot_mag.m will then generate a plot like the one shown below. Note the magnitude at rad/sec ( seconds) approximately matches the value we calculated by hand ( dB). If you calculate the magnitudes manually (in dB) and store them in the vector M and store the corresponding frequencies in the vector w, then the following commands will generate a plot like the one shown above. Inspection of the above Bode plot shows qualitative agreement between the magnitude response predicted by theory and the experimental data we recorded. Some of the difference can be attributed to mismatch between the assumed and actual component values (R and C). However, the primary cause of the discrepancy is that we performed our experiments by sweeping through the frequencies of square wave inputs, rather than employing sinusoidal inputs, as is the standard for frequency response analysis. We employed square wave inputs in order to build intuition for why a system responds differently to inputs of varying frequencies. Furthermore, most models of Arduino board do not have the ability to generate analog outputs. While we did not construct the phase response portion of the Bode plot for this circuit, the data we recorded does provide some intuition here as well. Consider that one period corresponds to 360 degrees. For a square wave input, we can consider that the wave switches from 5 Volts to 0 Volts at the 180 degree position in its cycle. Furthermore, we can approximate the wave as reaching its "peak" at the midpoint of its ON state, which would be at the 90 degree position of its cycle. When the square wave input is slow, for example seconds, the output reaches 5 Volts relatively quickly as compared to the length of the period. As such, the "peak" of the output wave lags behind the "peak" of the input wave only slightly. As the frequency of the input increases, for example seconds or seconds, the output reaches its maximum value at the point when the input switches from 5 Volts to 0 Volts. Therefore, the output reaches its peak at the 180 degree position, which is 90 degrees after the input reaches its peak (phase = -90 degrees). This agrees with the theoretical Bode phase plot generated at the beginning of this activity. This behavior also makes intuitive sense. Since it takes time for a physical system to react to a change in its input, the output will always lag behind the input. The "speed" of the system is in essence constant (the time constant doesn't change), however, the time it takes a system to react as a percentage of the input's period increases as the input becomes faster. In other words, is the same whether the input has period seconds or period seconds, but becomes a much larger percentage of the period as the frequency increases. This sort of behavior is indicative of most physical systems in that the output will lag behind the input to a greater degree as the frequency of the input is increased. If you would like to experimentally generate the frequency response of this circuit employing sinusoidal inputs, there are a couple of options. One approach is to use an external function generator to generate the inputs to the RC circuit, rather than generating the input from the Arduino board. Another option is to employ a board that is able to generate analog outputs. One such example is the Arduino Due. Most other Arduino models (Uno, Mega 2560, etc. ), however, can only generate digital outputs. In that case, you can consider the input to the circuit to be the duty cycle of a pulse-width modulated square wave. Therefore, you can observe the frequency response of the circuit by sinusoidally varying the duty cycle across different frequencies. To see an example of this approach, refer to the system identification experiment performed for a Boost Converter Circuit in Activity 5b. In Part (c) of this activity, a controller is implemented to change the response characteristics of the RC circuit. All contents licensed under a Creative Commons Attribution-ShareAlike 4.0 International License.